Demolished - the station was demolished c.1980. The site is partially covered by a large industrial unit, while the east end of the site is awaiting redevelopment. Part of the goods yard was lost under an extension to Mc Mullen's brewery. To the west of the station the bridge over the River Beane has gone, and the alignment between the river and Port Hill has been used for a small industrial estate. The Port Hill overbridge is extant but the arches have all been bricked up, and there is no evidence of the engine shed. To the east of Port Hill the overgrown track bed is extant as far as Archers Close but with no public access. Beyond that is the start of the Cole Green Way. Notes: The first railway station was built by the Northern and Eastern Railway in 1843 opposite what is now The Great Eastern Tavern in Railway Street. This position, rather than one closer to the town, was chosen so as to keep the station at some distance from both the prison and Christ's Hospital School. 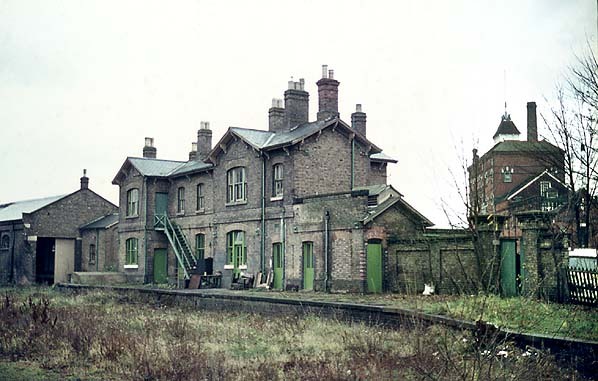 The station was at the terminus of the new branch line from the London-Cambridge railway at Broxbourne. This station was renamed Hertford East in 1923. In 1858 a second station was built at Cowbridge with the branch from the Great Northern Railway from Welwyn. 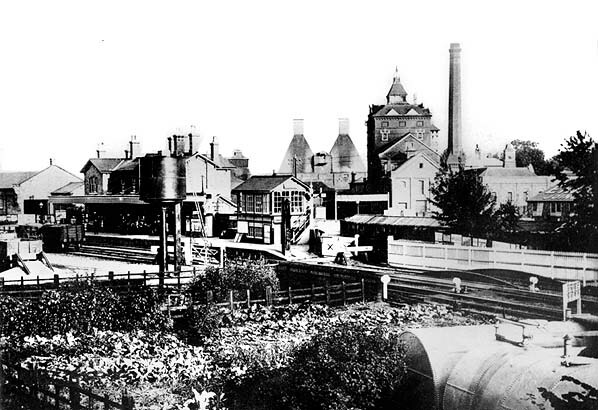 The station was adjacent to Mc Mullen's Brewery, with access via a wide spur off Hartham Lane, which still exists today. Although this station was officially called Hertford it was more usually known as Cowbridge and is even shown as such in timetables, although not on tickets. In 1888 a link to the first station was added; this was used only for goods traffic and never had a passenger service. end controlled access to the large goods yard which was sited to the east of the station. The goods yard comprised four sidings on the up side of the line, one of which passed through the large brick-built goods shed, and another passed in front of it. There were two small turntables at the west end of these sidings for transferring a single wagon from one siding to the other, and a short loading dock at the east end of the station. There was a 5-ton crane in the yard. The coal yard was on the north side of the line opposite the station. This had a further three sidings with a water tank at the west end of the yard close to the River Beane. A number of private sidings were sited at, or close to, the station; these included Ewen & Tomlinson's siding, Gilbertson & Page siding, Gripper & Wightman's siding, Kings Meads siding, Mc Mullen and Son's siding and Manser and Co's siding. A rudimentary shed was created by using arch No.2 of the five-arch bridge over Port Hill at the west end of Cowbridge station, with a timber extension, giving a 'shed' of some 62 feet in length. There were two proposals for this to be replaced with a more normal structure, in 1874, and again in about 1890. Instead the GNR closed the shed c1896, and it was quickly demolished. The 1890 and 1923 OS maps still show the track passing through the arch, but the timber extension has gone. The station was renamed Hertford North on 1st July 1923, but its days were numbered as a new Hertford North station was opened on 2nd June 1924 following the completion of the loop from the Great Northern line from Wood Green (now Alexandra Palace) to Stevenage. 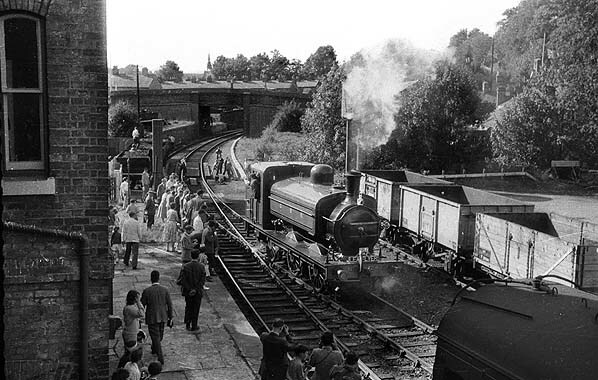 At this time services into Cowbridge were diverted into the new station, with the old station being retained for goods traffic as there were no facilities at the new Hertford North. 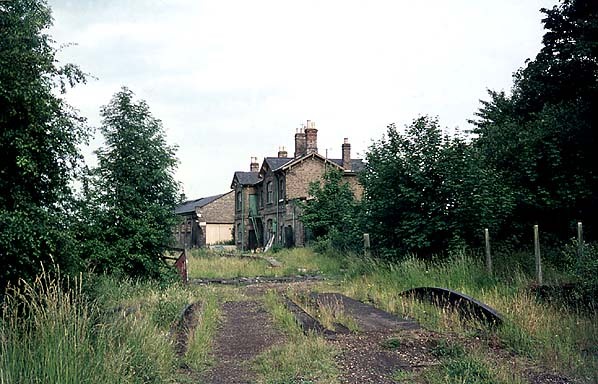 The goods station was downgraded to a coal depot only on 3rd January 1966, closing completely on 18th April 1966. Cowbridge station was demolished c.1980. The Hertford & Welwyn Junction Railway Company was formed on 25th June 1853, but before the company could apply to Parliament for authority to build their railway the GNR wrote to the promoters in an effort to take control of the line if it was eventually built. On 3rd July 1854, the Hertford & Welwyn Junction Railway received parliamentary authority to build a line from the Eastern Counties Railway at Hertford to a triangular junction with the GNR at Digswell with running powers into Digswell (which was later renamed Welwyn North). On 30th September 1854, there was a proposal to extend this line across the GNR to Luton and Dunstable linking three established railway companies (ECR, GNR & LNWR). Not wanting to be left out, the GNR offered to work the line between Hatfield and Luton although it was not prepared to provide any finance. The Luton, Dunstable & Welwyn Junction Railway Act was passed on 16th July 1855 authorising a junction with the LNWR at Dunstable and a second triangular junction with the GNR at Digswell, together with a bridge over the GNR to allow through running over the H & WJR between Hertford and Dunstable. All three companies were authorised to work the line. opposed by a minority of disgruntled Luton shareholders who claimed that passengers would be forced to travel to London via the Eastern Counties main line at Hertford rather than using the shorter GNR route via Hatfield. The amalgamation was passed at a heated meeting on 26th January 1858, but although both lines were completed and approach embankments were constructed, the linking bridge was never built due to restrictions imposed by the GNR, nor were the triangular junctions which would have allowed trains to run north into Digswell. The Hertford line was opened to goods traffic on the last day of February 1888, with passenger services running from 1st March 1858 between Hertford (often referred to as Cowbridge) and Welwyn Junction on the GNR; the service was operated jointly by the GNR and the ECR. Welwyn Junction station provided interchange facilities with the Great Northern, and passengers could continue their journey south towards Kings Cross or north towards Peterborough. No intermediate stations were opened with the line, but by December 1858 stations at Cole Green and Hertingfordbury appeared in company timetables. The line continued east for a further 1200 yards beyond Hertford station to connect with the Eastern Counties terminus (later Hertford East) but this connection was never used by passenger trains. Work on the Luton line had been progressing during the amalgamation negotiations, and the first section of the line between Luton and Dunstable opened for passenger traffic on 3rd May 1858. April 1860 the H & LDR informed both the Eastern Counties Railway and the GNR that they were terminating the 1858 agreement. The GNR immediately took steps to take over the line because of its strategic importance as a link between the three main lines; a Parliamentary Bill was prepared to facilitate this. At this time the line was nearing completion, with a special train carrying LNWR officials on 12th June and another 'special' on 17th July for company shareholders. After passing its Board of Trade inspection, the line between Luton and the Great Northern was opened to both goods and passenger traffic on 1st September 1860. Welwyn Junction station closed on the same day with trains on both lines making a junction with the Great Northern, and the services terminated at Hatfield where a bay platform was provided for Hertford trains.. The Hertford, Luton & Dunstable Railway was absorbed by the GNR under the Great Northern Railway Act of 12th June 1861. This gave the GNR exclusive rights to operate the line. In December 1868 new parallel lines into Hatfield were brought into use for both branch services, and the earlier junctions were removed in January 1869. In an attempt to attract more passengers to the Hertford line railmotors were introduced in 1905, and two new halts (Attimore Hall and Hatfield Hyde) between Welwyn junction and Cole Green first appeared in public timetables in May 1905, but they were not well used and closed a month later. provided at the junction of both the Hertford and Luton lines, close to the site of the earlier Welwyn Junction station. 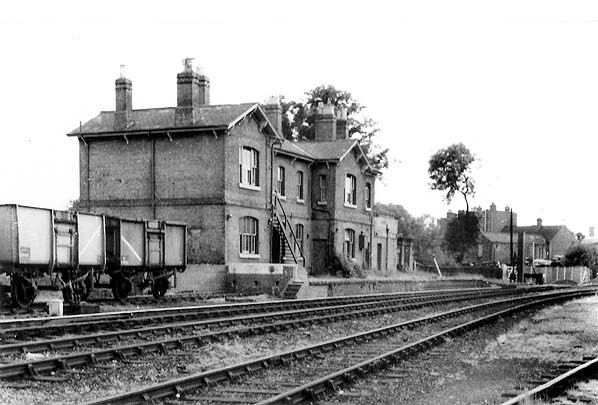 On 14th August 1920 the halt on the Luton line became a public station, known as Welwyn Garden City Halt; however the halt on the Hertford line did not and was closed once the construction of Welwyn Garden City had been completed. A new through station at Hertford North opened on 2nd June 1924 with the opening of the Hertford loop line, when the Enfield branch was extended north to create a diversionary route for the main line to King’s Cross. The new station was less well sited for the town centre than the earlier branch terminus at Cowbridge but it did provide Hertford with a service north to Stevenage for the first time. Cowbridge was now redundant and closed to passengers although it continued to handle goods traffic as there were no goods facilities at the new station. Sentinel-Cammell steam railcars were tried on the line in 1930s and, although popular with passengers, could not cater for peak demand. From 17th September 1944 most trains from Hertford terminated at Welwyn Garden City rather than Hatfield. from Hertford North saw a number of passengers wearing Victorian costume to commemorate the passing of the line. The last two passenger service to use the line were railtours, an unadvertised Welwyn - Hertford branch railtour organised by the Stephenson Locomotive Society on 21st November 1959. Passengers arrived at Welwyn Garden City by service train from Kings Cross. They then transferred to a 2-car Cravens DMU for the journey to Hertford East via Cowbridge where they were booked to return to Liverpool Street via Broxbourne on a normal service. The second was the South Bedfordshire Locomotive Club's Lea Flyer on 16th September 1961 which ran from Welwyn Garden City to Hertford North, back to Welwyn Garden City, then on to Luton Bute Street. The goods service remained in operation until 1962 when both intermediate stations were closed completely; the track was lifted shortly after closure. A goods service was retained to Hertford North (Cowbridge) until 18th April 1966, and the connecting line to Hertford East closed at the same time. All traffic over the line ceased on 23rd May 1966 with the closure of the landfill site at Hollywell Hyde. Welwyn Garden City during the construction of a new flyover south of Welwyn Garden City. After this, the only access to the branch was from the Welwyn Garden City goods yard. Traffic to to GKN ceased in the mid 1970s although the siding officially remained open and by 1981 Norton Abrasives received one train per week with four to six wagons. The last working was on 12th November 1981 when a Class 31 collected empty wagons. Two weeks later two short pieces of rail were removed from the track at the point where the branch swung away from the main line and the remaining track was quickly lifted. The 6.5 mile Cole Green Way cycle and bridleway between Welwyn Garden City and Hertford now follows the course of the line. It is part of National Cycle Network Route 61, and the Lea Valley Walk. Sources: Hatfield, Luton & Dunstable Railway by G & S Woodward (1977). Published by Oakwood Press ISBN 978-0-853614-58-6. For further reading see Hertfordshire's lost railways by Keith Scholey ISBN ISBN 1 84033231 X and Branch Lined around Hertford & Hatfield by Vic Mitchell & Keith Smith (2009) Published by Middleton Press ISBN 978-1-906008-58-1. Other web sites: Lost Lines includes a series of photographs taken along the Hertford - Hatfield line in 1990. Click here to see an aerial view of the whole Welwyn Garden City - Hertford line line on Google Earth. All the stations are shown. Prepared by Mark Percival. 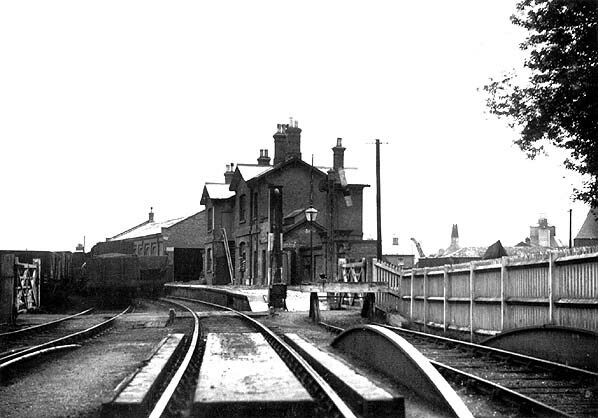 Hertford North station looking west before March 1906. This 1935 1" OS Map still shows the station as 'open' although it had been closed since 1924. The new Hertford North station can be seen to the west. Hertford North station c. early 20th century. Mc Mullen's brewery is seen in the background. 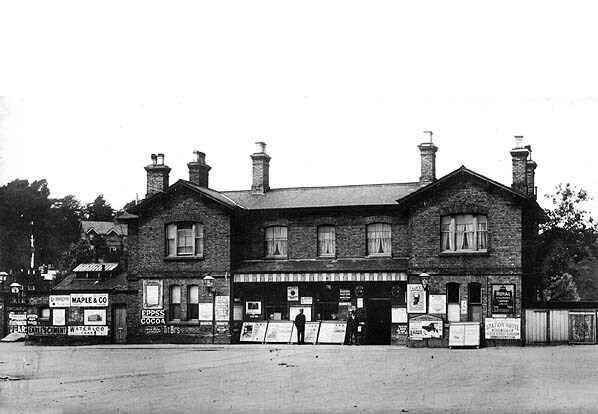 Hertford North station forecourt before 1910. Hertford North station looking east c.1930s, after closure to passengers. 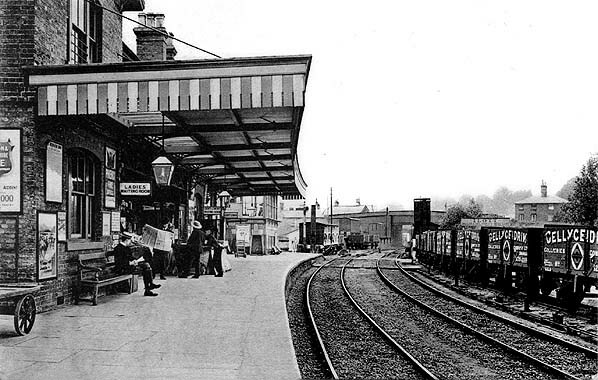 Hertford North station in 1960s. J52 1247 runs round at Hertford North during a visit by the Lea Flyer railtour on 16th September 1961. This was the last passenger train to run into Hertford North. 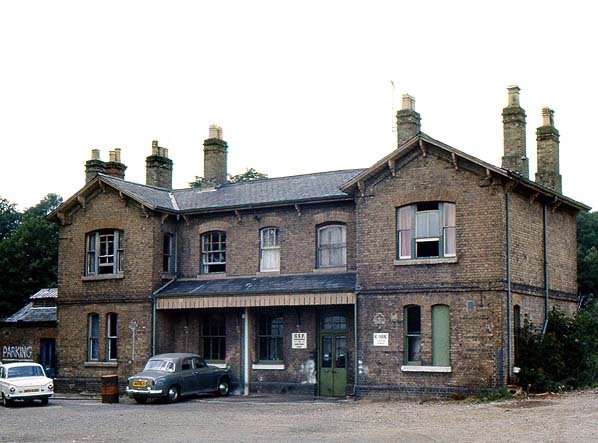 Hertford North station in 1968. Hertford North station in 1968 taken from the same viewpoint as the 1930s picture above. 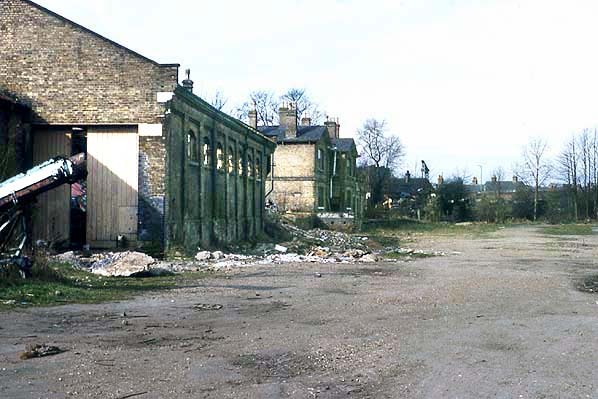 Hertford North goods shed and station looking west in March 1976. Hertford North station forecourt in July 1976. 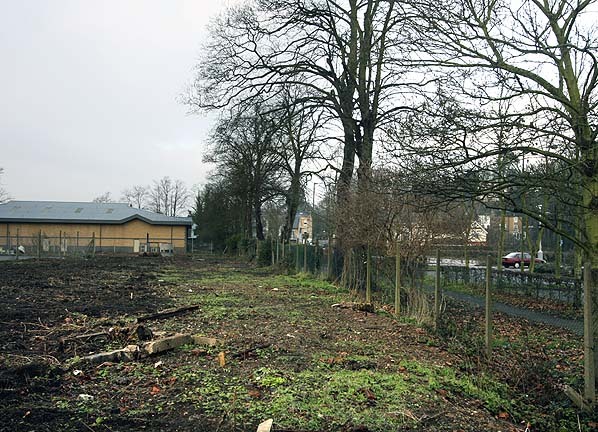 Looking west at the site of Hertford North goods shed and station in January 2011. 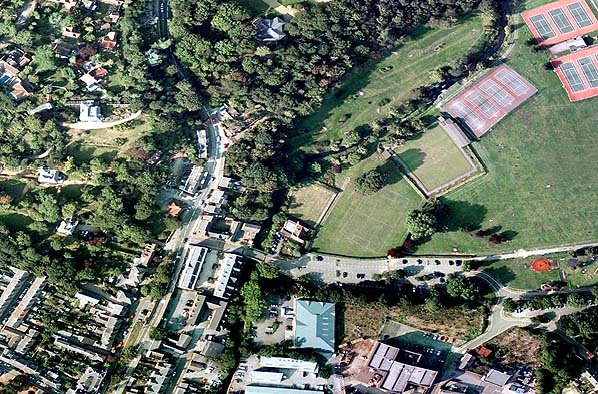 Aerial view showing the site of Hertford North station. The large building in the centre at the bottom of the picture is the site of the station. Click here to see this picture with the course of the line superimposed.